Sharing a bit of good news. 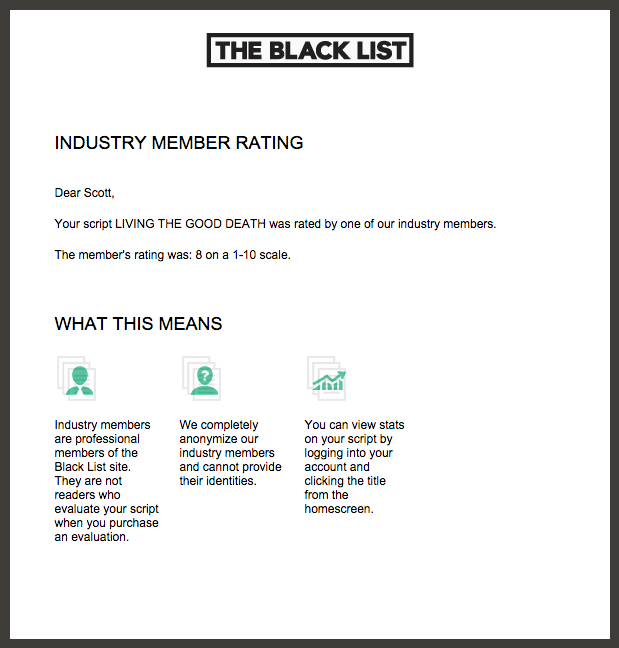 I recently posted my supernatural romantic comedy Living the Good Death to The Black List after making some revisions to it following input from the site’s paid readers. Several really astute observations were made, and after thinking about them and making some changes, I finally arrived at a draft that I felt achieved my expectations. The result? An Industry Member just rated it an 8. Having a busy industry member choose to read the script of their own free will and enjoy it enough to take the time to rate it really brings me joy. We know how busy people are in this industry, so it means a lot to me. I’d venture a guess that many of you would agree that whether or not a script is ever produced, just being able to entertain a reader with a story spawned from your noggin that they truly enjoy is a really good feeling for any writer. I for one hope to ride this wave of happy feelings well into the next script I’m currently outlining. Hopefully people will find that one enjoyable as well one day.